The Ferrolic clock designed by Zelf Koelman is nothing like the functional but wholly unentertaining ones most of us have on our walls. 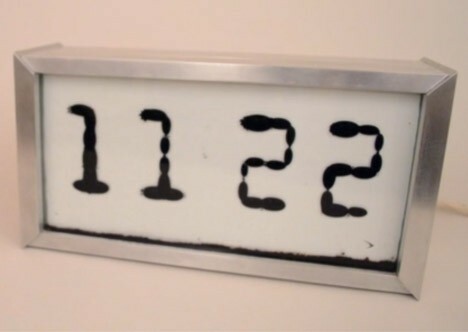 Instead of a digital or analog face, this clock is composed of ferrofluid, a liquid containing suspended magnetic particles. The front of the case is filled with fluid so the ferrofluid can move gracefully anywhere it is directed. Behind-the-scenes electromagnets control the fluid’s movement, creating fascinating little animations or forming a display of the current time. The screen’s display is controlled by web-based software. 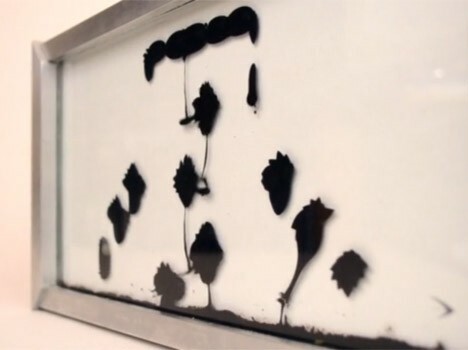 The user can change the display to suit their own tastes, making the ferrofluid perform hypnotic dances or form a display of text or the time. The ferrofluid naturally follows the changing positions of the embedded electromagnets – kind of like the Wooly Willy toy that gives you a magnetic “pen” to rearrange metal shavings on a drawing of a face. The movement of the ferrofluid seems so similar to the movement of living things that it’s hard to remember it’s actually tiny bits of metal floating around. Koelman’s design came about after he “fell in love with the magical characteristics of a little black ‘blob’ in a bottle.” He studied ferrofluids for a year while working toward a masters degree in industrial design at the Eindhoven University of Technology. Ferrolic gives life to the “blobs,” letting them move and dance in their own environment. Koelman plans make small quantities of the product at $8,300 each after the design is perfected. See more in Clocks & Watches or under Gadgets. September, 2015.